Spain is in the grips of a crisis at the moment. This week the Catalan region â€“ located in the north-western corner of the country â€“ voted by an overwhelming majority to secede from Spain. This was in spite of a brutal police crackdown on the vote, which had been declared unlawful by the government in Madrid. Despite opposition from the national government, it appears Catalonia will forge ahead with a unilateral secession. The secession movement is inspired in great part by Spainâ€™s painful history. The country fought a brutal civil war from 1936 to 1939, which was won by the fascist regime of General Francisco Franco, who then ruled as a military dictator until his death in 1975. Prior to that, Catalonia had operated as a politically autonomous region, but Franco denied them that right. His regimeâ€™s policies oppressed the Catalan people. For example, they were forced to choose Spanish names for their children and languages other than Spanish (also known as Castilian) was banned. In no way is the current Spanish government comparable to the fascist regime of Franco, but the feeling that Catalonia remains marginalised is very strong. The police crackdown on the referendum only served to reinforce that perception. Football has a massive and passionate following in Spain. Inevitably, it has become caught up in the secessionist furore. Barcelona is the largest city in the Catalan region, and it is not inconceivable that if the secession movement succeeds, FC Barcelona could find itself expelled from La Liga. Such a decision would also affect smaller teams RCD Espanyol and Girona FC. To understand just how serious and personal this situation is for the people of Spain, look at Barcelona defender Gerard Pique.Â A mainstay of both the BarÃ§a and national football sides, he is outspokenly supportive of Catalan independence. His comments have reportedly made the Spanish national team captain Sergio Ramos very angry, and the two are not speaking to each other. This is unsurprising though. Ramos plays for Real Madrid, a team which is very much aligned to Spanish nationalism, shown by the endorsement it enjoys from the Spanish royal house and the warm relationship it enjoyed with Franco. The spat has created an awkward situation for the national team, and Pique has indicated that he may even resign from it. The tensions between Spain and its various regions, who have distinct languages and cultures, have often played out within the national football team. It was hugely notable when they won the 2010 World Cup. At the time, the commentary was that after decades of regionalist rancour, the players had finally learned to unite and to play together. 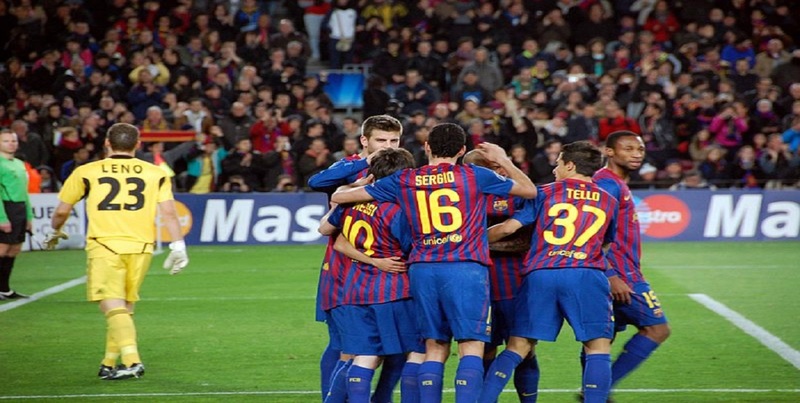 The teamâ€™s unity, and even the tiki-taka style it played, came to symbolise Spanish patriotism. The Spanish side held an open training session on Monday but it was cut short after just 23 minutes because of the volley of insults that was hurled at Pique from a section of the attending fans. If the secession succeeds, itâ€™s not impossible that teams in the Catalan region may be forced to play in other countries. Barcelona president Josep Maria Bartomeu has already confirmed that the board will discuss leaving La Liga, and that the English Premier League is a possible destination. The league would almost certainly leap at a chance to welcome a football powerhouse into its ranks â€“ and flights from Barcelona to Manchester, in the far north in England, are only 2.5 hours long. â€œItâ€™s an interesting situation to see how it will develop because it will have an impact on the sporting side as Barcelona is a highly political club,â€ he said. And thatâ€™s how the defenders of Stoke City or Burnley could find themselves in a futile chase of Lionel Messi and Luis Suarez. Stranger things have happened.